The VLS-100 Variable Luminance Source is a controllable source of uniform, visible illumination for testing cameras, image intensifiers, and visible to near-infrared night vision devices. It is used with I-SITE™ software or as a standalone, computer-controlled device. The Variable Luminance Source brightness is computer-controlled and continuously adjustable over a range of 2000cd/m2 -0.00001 cd/m2. Luminance accuracy is <3%*. The VIS-NIR spectral output remains constant over the entire brightness range. The source features a 50mm diameter output port with <5% luminance non-uniformity across the aperture. *Stated luminance accuracy applies to output range of 2000-0.001 cd/m2. Values from 0.001-0.00001cd/m2 may exhibit a larger uncertainty. The Variable Luminance Source is part of an overall measurement system and requires other measurement instruments to be effective. This is an image intensifier using a visible source such as the VLS-100 Variable Luminance Source. 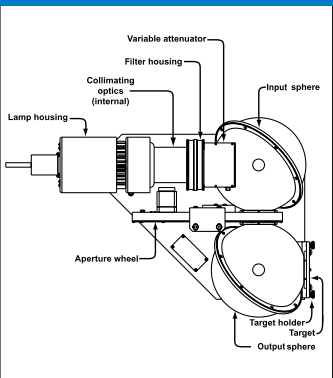 The Photometric Camera uses a microscope objective for this application. The gain of an image intensifier is determined using the absolute luminance values measured on the phosphor surface. 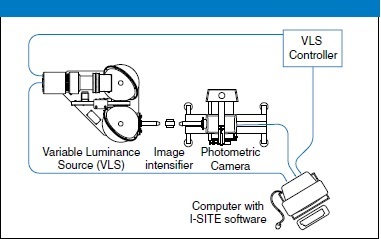 VLS-10 Photometer: Measures and displays source luminance. The photometer is calibrated in photometric units to NIST traceable standards. Additional equipment will be necessary to support some of the measurements described. 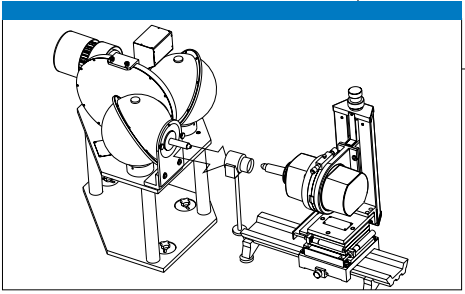 A typical test facility would also include a measurement device and a collimator. Control of the VLS is through a computer running software.Optikos can provide complete test systems to suit most requirements. The patterns on target plate sets include slits, circular apertures and 4-bar targets. Target plate patterns may be fitted vertically, horizontally or at 45 degrees in the output port. Slits and large 4-bar targets are centered on separate plates.